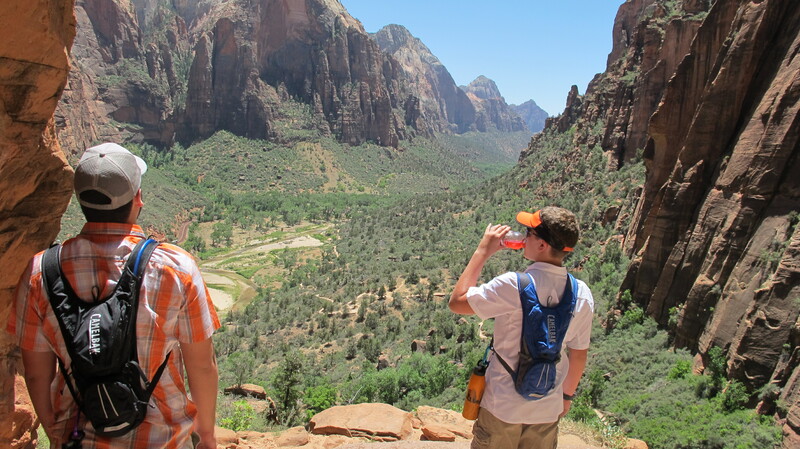 For the past several years, I have taken my boys on road trips throughout the United States to experience hiking in national parks, swimming in the oceans and cheering on my beloved Irish (Notre Dame Football.) 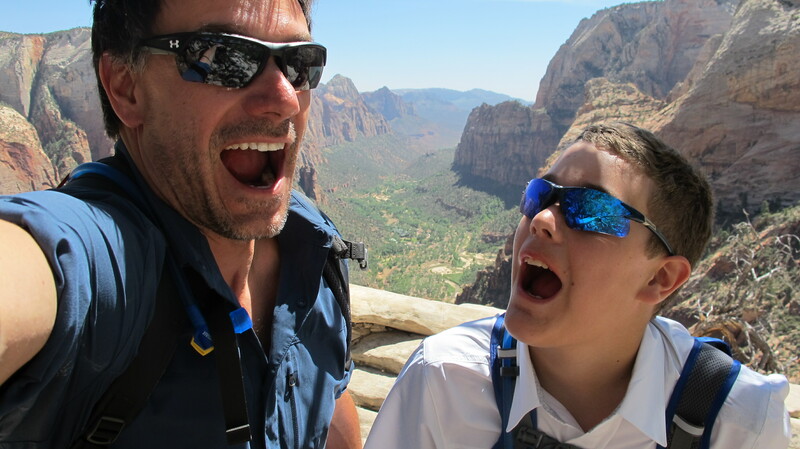 We have been fortunate enough to visit both coasts, the Southwest, New York, Las Vegas, Chicago, Dallas, San Diego, Orlando, Myrtle Beach, the Rockies, the Appalachians, and have had countless #selfies near so many famous (and not so famous) sights. 🙂 The time we have spent together during these adventures have been the most precious moments in my life. While I would like to say it has all been done selflessly and in the spirit of fun, I have planned these trips with some specific goals in mind. I want to provide my boys with experiences and knowledge that will help them in their careers and lives as men. And of course I wanted to be the one to furnish them with the knowledge and memories. I love being a dad, and I feel I can impart values and skills that just cannot be gained via traditional means. We all have egos and I am no exception. 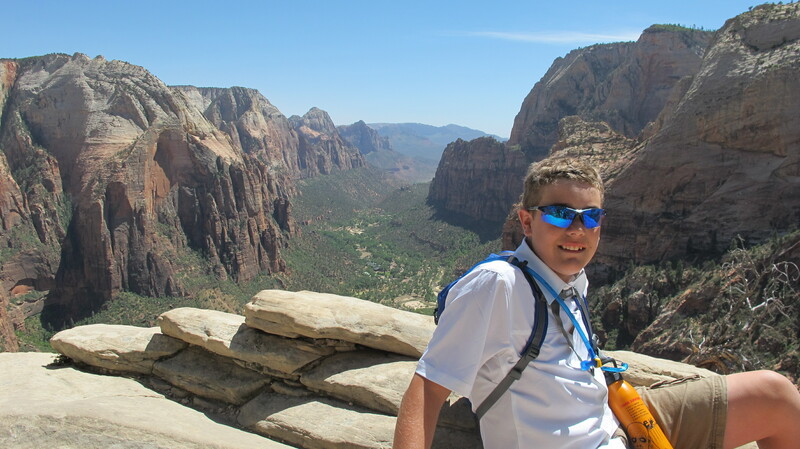 On this particular adventure up the side of a canyon with my son Evan, I learned more about myself and leadership than any book, personality profile, or coach could ever possibly provide. And I learned it not from my intellect, expertise and skills. It was from the courage and council of a 14 year old boy. 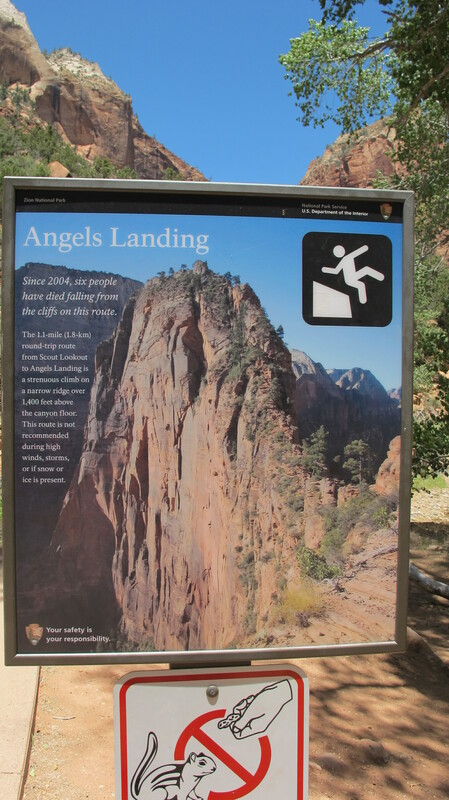 Angel’s Landing is a two and a half mile trek to the top of a 1488 foot tall rock formation, providing outstanding views of Zion Canyon in Utah. It is not for the feint of heart. 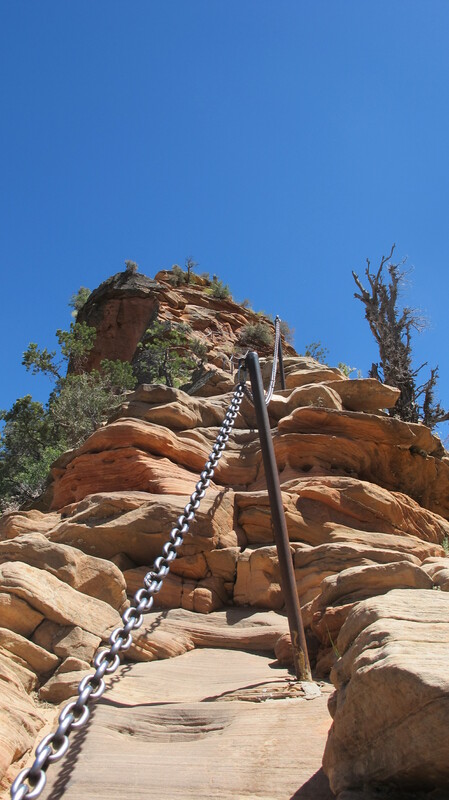 All that is between you and a 1400+ foot fall is a death grip on a chain that the park nicely pounded into the rock decades ago. What if I fall? If I fall, will the boys know what to do? OMG, what if the boys fall? What will their mother think? Could she call Child Protective Services and have them taken away? What if we get up there and cannot get down? The wind is really gusting today… maybe we should try another time. What if we get injured and cannot get back down? We have already come far enough… the view is amazing from RIGHT HERE. Are those chains really gonna support my weight? Ugh! It was at this point Jack decided he was not going to continue up to the landing. I was so relieved. My rationalizations were confirmed. I would not have to face the fear of heights that lay before me, child protective services, or more importantly, voice the fact that I was terrified. Whew. Always hang on to the chains. Watch your footing. I am here, you can always grab my hand for a lift. Never look down. One step at a time. For God’s sake be careful. That rock is slippery, take this path instead. Take your time. LOL. That advice was more for me than him. Evan was smiling. He made jokes. 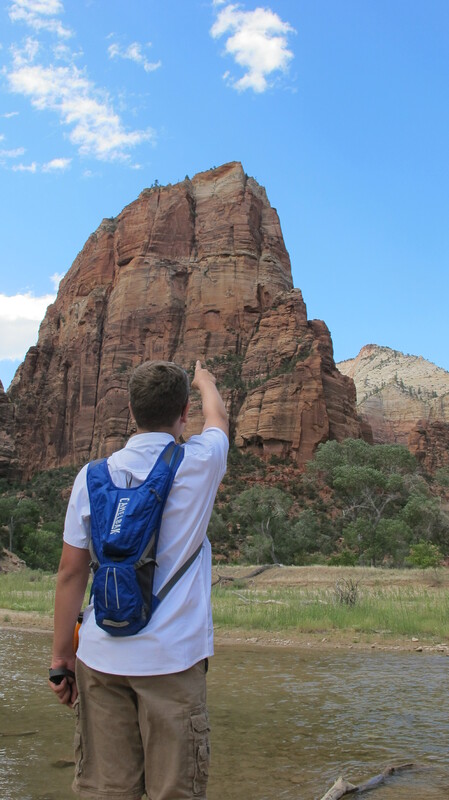 He took his time and stopped and looked out at the canyons all around us. He pointed out wildlife, colors, and commented on the wind, the day, the experience. Never once did he take my hand. He nodded at all of my badgering and commands. He kept smiling and kept reassuring me he was fine. He was grateful. He thanked me for the hiking boots we had purchased the week before and told me how they made the climb easier. He was relaxed and comfortable. He was in the moment. His confidence and quiet reassurance gave me strength. He was leading me. I am kicking myself and am ashamed now, because at every turn I put doubt into his mind. I always gave him the option to turn back. I made it easy for him to quit, to fail. I put my own fears above his experience. Where was my training from the book Good to Great? Personal humility? Selflessness? I had taken a once in a lifetime experience and reduced it to anxiety, fear and a task to look good in front of my son. What was I thinking? After 40 minutes holding on to the chains, negotiating the top of sheer cliff faces and enduring the endless worries I vocalized, we reached the top. 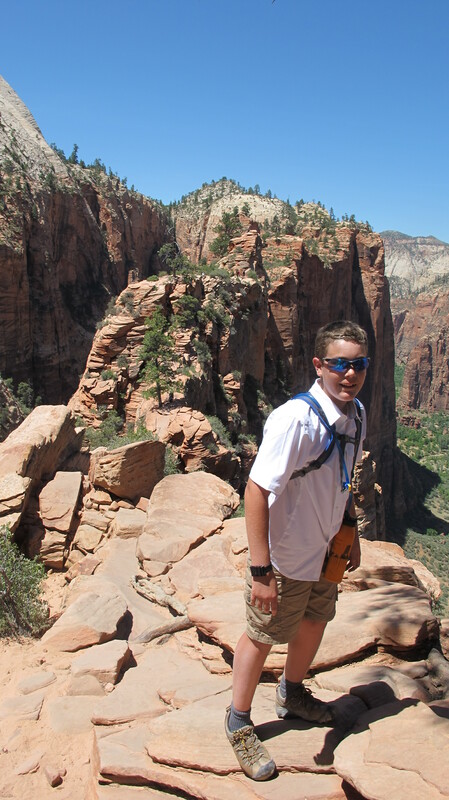 I watched Evan make the final steps and had such a rush of emotion: pride, accomplishment, exhilaration and shame. He had led me to the top. On all fours, we gazed at the majesty around us. It was indeed a landing for angels. We looked at each other and could not stop smiling. We sat up top and felt the gusts of wind blow through our hair. We gazed down on from where we had come and tried to pick out where Jack must be sitting. 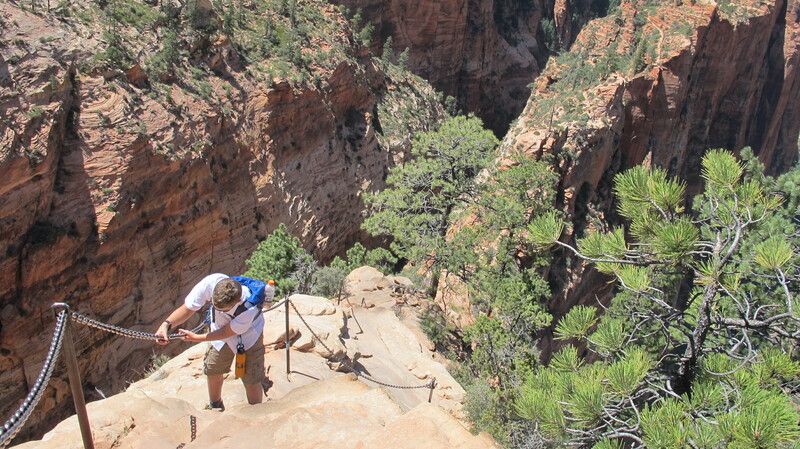 We reflected on the climb and some of the dangerous parts. He let me know that he was scared at some points, but was focused on making it to the top. He had never once let that show during our assent. We shared many moments in silence, just sitting next to each other enjoying the view and relishing the journey we had shared. And then Evan hugged and thanked me. I guess he did not think I had failed him. I still tear up thinking about that moment. I remember thinking that Evan was not any longer a boy, but a man. Selfie on Angel’s Landing! Woohoo! My soul renewed, and fresh insights about myself to ponder and explore, all that was left to do was take a #selfie and begin our descent. His actions and traits on that day: courage, confidence and positivity, inspires me still today. Evan helped me overcome the negative speak that haunts all of us, and I look forward to another experience when I can follow him. Father, Publisher, CEO, Techie and Elkhart Native. 4 Things Media Can Learn from the Disruptors on Culture.